Bev ? 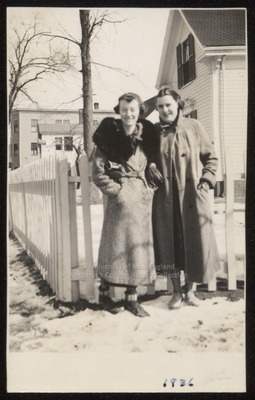 and Anne Moore, two Westbrook Junior College students, stand in the snow in this black & white candid snapshot with 1936 on the front. Both wear long winter coats and stand before a white picket fence and at the corner of a white house. Anne Moore has her arm linked through Bev's. Bev's coat has a wide fur collar and is belted at the waist. Bev wears heavy socks and low boots. Anne wears dark hose and heelless shoes. On the back written in blue ink is "Bev ? & Anne Moore."